Earth’s crust contains nearly all of the naturally occurring elements. 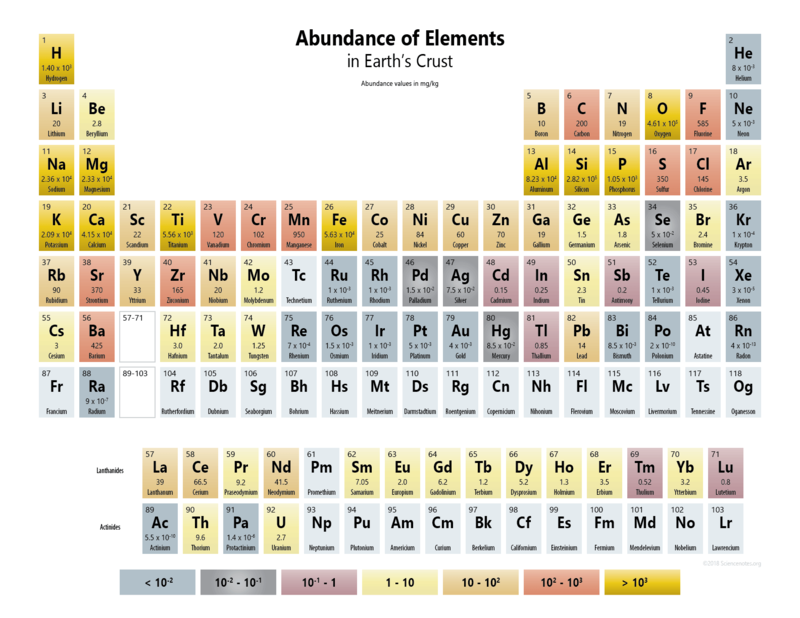 This table and periodic table shows the relative abundance of elements in the Earth’s crust. Each element is represented by its atomic number, symbol, name, and abundance in milligrams per kilogram of Earth’s crust. Since 1 milligram is one-millionth of a kilogram, these measurements could also be expressed as “parts per million”. A PDF of this table is available for easy printing. The colors represent a break in the ranges over an order of magnitude. Elements with no measured values or no data are left blank. Most of these elements do not occur naturally in nature (93-118). The abundances recorded are a median of measurements taken from around the world. Not every kilogram of dirt contains 0.004 milligrams of gold.